A cut above the rest. Our professional telescopic extension pole and saw blade combination will easily assist with pruning back branches at heights without the need of a ladder. SUPER TURBOCUT teeth effortlessly cut into greeenwood in all directions to the grain, bark cutter to prevent the peeling-off of remaining bark when a branch is cut. Made from chrome-plated carbon steel so it stays sharp. Hook keeps the saw in the cut. Bark cutter prevents tearing of bark. High quality Japanese blade. 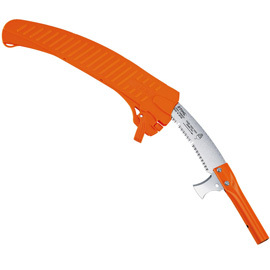 Blade length 40cm.